There have been some blogs related to this topic. The ones I found always showed a solution where you needed to customize the system. One of these blogs is from Munib Ahmed. He is also one of the current Microsoft Dynamics AX MVPs. This could be a good solution, but when possible I would like to avoid customizations. So this blog will describe a way to achieve the requirement for another order of the dimensions using standard setup. First I will describe the standard way how AX will display these dimensions. Assume you have setup three dimensions: BusinessUnit, CostCenter and Project. 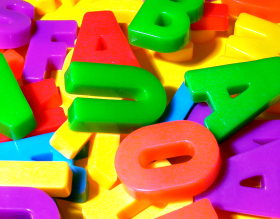 On forms like Customer details the dimensions will be displayed in alphabetically order. It is sorted on the Dimension name. As mentioned above the sorting is on the Dimension name. So we can change the dimension names having a pattern with a prefix which manages the order. You can see an example in the next screenshot. When you only change the Dimension name on the forms it will also show the dimensions with the prefix D00#. Per dimension you can setup a Translation. 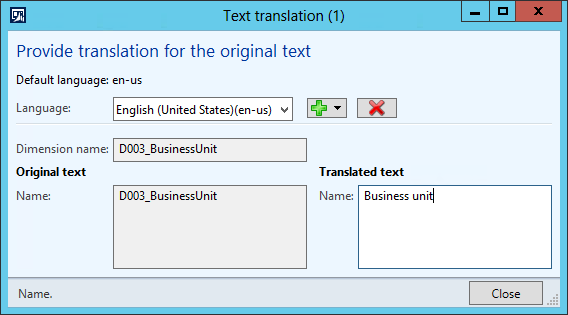 If you enter the translations for your language (or languages) the translated text will be used as a friendly name. It is not possible to start the Dimension name with a number. It should be a letter. Also spaces are not allowed. When you change the name after you have entered the Translated text it will reset the translation to the new Dimension name. So in that case you have to re-apply the translations. Probably a customization as blogged by Munib would be your choice if this would be too cumbersome. You can leave some gaps in the numbering to be able to easily add new dimensions in between when needed. It worked until I saved and refresh. It went back to Financial dimension name. I then tried to reenter the translation and it still keeps going back to the name. Have you seen this issue? I’m in D365. When you look at the additional notes, then there is a situation where the translations will be reset to the default. Is this your scenario? If not, please elaborate in more detail what issue you are facing.